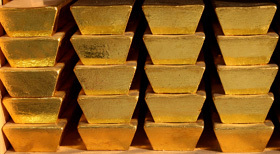 comex: baisse des couvertures pour l'or, mais pas pour l'argent ! inchangé pour l'argent ... c'est dingue,ça ! Re: comex: baisse des couvertures pour l'or, mais pas pour l'argent ! est ce pour détourner les spécs de l'argent vers l'or, à l'approche des options or et argent? ils ont vraiment un pb sur l'argent, pour en arriver à ce genre de manoeuvre ! The latest reduction in margin requirements for gold is a blatant attempt to siphon speculator interest away from July silver prior to option expiration and first notice day. This is the clearest signal yet that they are on the ropes with silver delivery. At the prior spec margin of $6,751 for gold it already enjoyed leverage of 22.81 - 1, based on $1,540 gold. By decreasing margin requirements to $6,075 they have increased leverage another 11% to 25.35 - 1. This is totally irrational when you realize silver is mired in leverage of only 8.30 - 1, based on $35.85. Gold already had 315% more leverage than silver, yet by reducing gold margins further it now is a whopping 350% higher! This is even more absurd when you realize gold is only 2 1/2% off its all-time high, while silver is still 28% lower than its most recent top. Any CME talk of risk modeling is pure rubbish when leverage of 22 - 1 is increased further to 25 - 1, while silver is clamped at 8 - 1. All risk models must factor leverage ratios, and the CME has thrown that out the window in favor of protecting silver shorts. I'm sure they think they can better control (and rig) the new spec interest coming into gold futures. There's probably at least a few hedge funds dumb enough to pull out of silver in favor of gold. After all, they can buy 3 1/2 gold future contracts for every 1 silver contract. The CME just tipped their hand BIG time IMO, and they are pulling out all stops before the end of the month. When the silver market blows up it will then be obvious to all that the CFTC was nothing more than an illusion of enforcement, and in reality a PR division of the banking cartel. Like the guy in the band Spinal Tap, whose guitar volume knob went to 11 instead of merely 10, my silver bullishness is now an "11". Is The COMEX Manipulating Gold Margins To Mask Silver Supply Deficits? June 17, 2011 By Patrick A.
down on a silver contract. market by offering them greater margin opportunities in the gold market? them available for that purpose. percentage of them were settled for cash, as is permitted under COMEX rules. contracts. The timing is definitely suspicious. finances to reasonable debt levels. did not cure the problem of the Greek government spending beyond its means. could themselves quickly begin defaulting on their debts. and silver, the only forms of money that have never failed. text archives posted at http://www.1320wils.com. la CME se prostitue pour que les spécs aillent sur l'or ? regardez un peu les leviers sur les différents " produits" ! qu'on vienne pas dire qu'on se batte contre la soit disant spéculation, tout ça c'est du vent ! It's no coincidence that silver is the lowest leverage of all, while gold is the highest. I'm sure the malarkey CME reason is that gold is less volatile. That is true strictly in the sense of it always having a propensity to getting capped at 1% gains. They undoubtedly don't consider $40 plunges like today part of the volatility equation. The fact is that gold leverage is 307% more than silver, 223% more than crude oil, and even 178% more than corn. It is 142% the leverage of its nearest competitor, copper. Look for the high gold leverage to remain, and even increase in a desperate attempt to thwart silver speculators. Only when physical gold starts exiting the Comex in significant numbers will it then be punished with single-digit leverage. BTW, The low leverage ratio of wheat would also imply there's shorts in trouble there as well. The NFP report was SO awful that the best they could do was another 1% cap job. The high tick (as of 12:00 EST) was 1546.00, or 1.00% on the nose. I still smell a rat however, and am not yet willing to declare a cartel defeat. For reasons that at first appear puzzling gold leverage is being allowed to float to the algo heavens. The gold spec leverage at $1,546 is now at 25.43- 1, but more importantly the commercial (read: cartel) leverage is a whopping 34.36 - 1. The CME is showing they have no real regard for risk management. By allowing 34 - 1 leverage they must feel there is no real risk when the short seller is backstopped by the U.S. taxpayer. They are also showing that the silver situation is just THAT scary, and gold leverage is still the way to continue to siphon off interest in silver. If there's one thing I've learned it is that buying extreme leverage rarely works out. Normally high leverage ratios always get resolved in the short sellers favor. The big August gold futures contract set to roll in 3 weeks also coincides with a debt ceiling showdown and an obviously failing economy. Any "giddy" solutions or compromise will be the cartel signal to attack. At least for now color me, cartel wary. Gold is very close to making an all-time high close in dollars, after all The Gold Cartel has done to calm the price down.